You know what? We’re tired of everyone talking about “the golden age of jazz!” In fact, we’re tired of gold altogether. 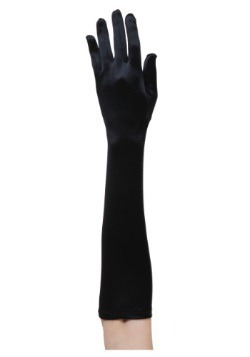 You know what’s hot right now? Silver! 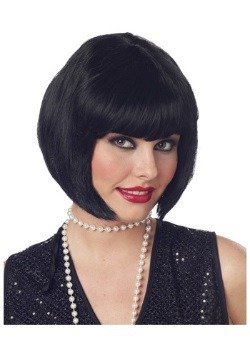 And if you jump on board, you can be rocking the “Silver Age” look before it becomes the newest sensation. Gold is so...traditional. It’s almost cliche if you think about it. “As good as gold?” Yeah, we’ve heard that a million times. But…”As scintillating as silver?” We think that’s a term that will really catch on! This Women’s 1920s Silver Flapper Costume is...well...as scintillating as silver, if we do say so ourselves (and we do)! It’s all the class and iconic style of the Golden Age, but in refreshing and refined silver tones. Too cool! So grab a dance partner who likes to shake things up a bit and hit the swanky soiree. We won’t mind if you yawn at all those gold-toned flappers, but be kind—not everyone has such cutting-edge style! 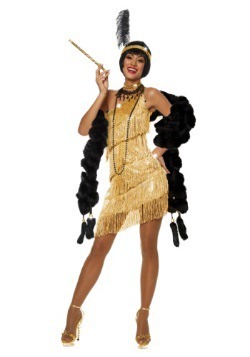 Nothing says “fun” faster than a well-assembled flapper look, and this is no exception. The tank style dress is adorned in silver sequins, a black lace inset, and fringe accents. The skirt boasts a coordinated lacy look, and the silver, feather-adorned headband tops this style off and draws it all together. So slide on the included glovettes and finish this look with your best strand of long pearls, because it’s time to pour yourself a sloe gin fizz and catch your crew up on the hottest fashion trends...namely, silver! So let those traditionalists keep their golden age of jazz—you’re ushering in a whole new take on a classic. Welcome to the Silver Age of Style, darlin’, where the clothes are cool, the drinks are colder, and a little shine goes a long way!